The Lord Jesus Christ was tried according to two legal systems: the Judaic system, which was considered to be the fairest (being built upon the principle of handing out punishment equal to guilt, as had been originally established in the law given by God to Moses – an eye for an eye and a tooth for a tooth), and the Roman system, which contained the most superior legal enactments and which lies at the base of modern jurisprudence. And according to these two systems the Saviour was condemned. Did this mean that the law pronounced a death sentence over itself when it condemned to death by crucifixion the very incarnation of Truth and Justice? This would have been true had the Saviour’s trial been legal. However, both trials suffered from gross judicial errors. After the miraculous resurrection of Lazarus, many Jews came to believe in Christ’s divine power. “Then gathered the chief priests and the Pharisees a council, and said: ‘What do we do? for this man doeth many miracles. If we let Him thus alone, all men will believe in Him, and the Romans shall come and take away both our place and nation.’ And one of them, named Caiaphas, being the high priest that same year, said unto them: ‘Ye know nothing at all, nor consider that it is expedient for us, that one should die for the people, and that the whole nation perish not’… Then from that day forth they took counsel together for to put Him to death” (John 11:47-50, 53). The Jewish leaders feverishly sought the means to accomplish their intent. 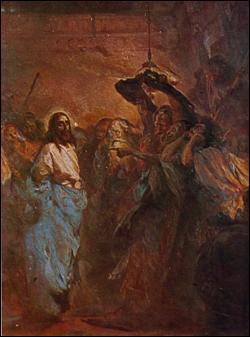 Falling into the sinful passion of avarice, one of Christ’s disciples, Judas Iscariot, offered to betray his Divine Teacher to them for 30 pieces of silver. In the evening of Thursday, after the Mystic Supper, Judas accomplished this betrayal. Christ was seized. The Saviour’s trial and His detainment took place at night in violation of the law. Moreover, the inquest began without an accusation from witnesses or victims. At that time only the high priest investigated the existence of guilt, thus bringing an accusation before the Sanhedrin. According to ancient Jewish law, just as in present times, the court should be objective towards the accused. But in the trial of Christ, the high priest simultaneously took on the functions of both prosecutor and defense attorney. The holy Evangelist St. John the Theologian confirms this: “The high priest then asked Jesus of His disciples and of His doctrine. Jesus answered him: ‘I spake openly to the world; I ever taught in the synagogue and in the temple, whither the Jews always resort… ask them which heard Me, what I have said unto them’.” (John 18:19-21). In His first words at the trial Christ did not try to justify Himself. He was more concerned for the soul of the high priest, which was under the threat of damnation in this unjust affair. His words reminded all that the law demands an accusation from eyewitnesses. For this reason, when one of the servants struck the Saviour in the face because of His answer, Jesus Christ said to him: “If I have spoken evil, bear witness of the evil; but if well, why smitest thou Me?” (John 18:23). In view of the obvious violation of the legality of the inquest, it was useless to expect objectivity from the court, and so Jesus ceased to participate in the unjust trial. “And when He was accused of the chief priests and elders, He answered nothing” (Matt. 27:12). Then they began to search for witnesses. “Now the chief priests, and elders, and all the council, sought false witness against Jesus, to put Him to death” (Matt. 26:59). Many were found, but their testimony was false. According to Jewish law, there were three categories of witnesses: false witnesses who were obviously lying; idle witnesses whose testimony was not confirmed by other proofs in the case; and reliable witnesses, whereby the testimony of several witnesses coincided. At the daybreak of Friday, the Sanhedrin convoked its meeting. It was a session of the lesser Sanhedrin assembly, although criminal cases, which were punishable by death, were required by law to be investigated by the greater Sanhedrin assembly. This assembly was twice as large, which was a requisite guarantee of the objectivity of the verdict. 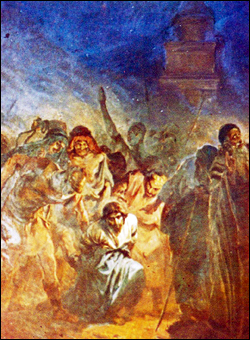 Many false witnesses appeared at the Sanhedrin assembly. From the holy Evangelist Matthew we learn that two of them declared: “He said: ‘I am able to destroy the temple of God, and to build it in three days’.” (Matt. 26:61). The judges accepted them as reliable witnesses. But St. Matthew called them false witnesses. They distorted Christ’s words about the fact that He, the Omnipotent God, will erect a new temple – not build by hands – on the site of the hand-built temple of Jerusalem, with which He foretold of His resurrection. Despite the testimony of the false witnesses, the described action did not merit the death sentence. Then the high priest himself began to conduct the inquest on the Saviour. The high priest said: “I adjure Thee by the living God, that Thou tell us whether Thou be the Christ, Son of God?” (Matt. 26:63). Jesus replied: “Thou hast said; nevertheless, I say unto you: hereafter shall ye see the Son of man sitting on the right hand of power, and coming in the clouds of heaven” (Matt. 26:64). Hearing such words, Caiaphas did something completely unprecedented – he tore the high priest’s garment. He thereby tried to publicly show his “righteous wrath,” but in essence he demonstrated his frenzied rage against the Lord. The high priest’s garment – gold-broidered, made from finely-woven golden and silver threads, was preserved and passed on as a holy relic from the time of Aaron. Thus the tearing of it became a visible sign of God’s invisible punishment – the depriving of Jewish priests of God-given priestly dignity. The high priest exclaimed: “He hath spoken blasphemy; what further need have we of witnesses? Behold, now ye have heard His blasphemy” (Matt. 26:65). These words clearly show how the “judge,” instead of preserving legality, becomes an accuser himself. However, the high priest said this because some of the members of the Sanhedrin, among whom was Joseph of Arimathea, insisted that they found no guilt in the accused. Soon after that the Jewish leaders pronounced the verdict: “He is guilty of death” (Matt. 26:66). Another violation was committed. Jewish law demanded that when the trial was over, the crime proven, and a death sentence expected, the accused was to be taken to prison, while the court sat in session the entire day, discussing the crime, the proofs, and the punishment (during this time it was forbidden to drink wine). And it was only on the following morning that the punishment was determined. The members of Sanhedrin violated this important guarantee of the fairness of the verdict. They were in a hurry, for the day of Sabbath, sacred to the Jews, was approaching, and it coincided with the feast of Passover, at which time it was forbidden to engage in any affairs. This also explains why the previous violations of the law were committed: the nighttime arrest, the nighttime trial, an inquest without accusations from eyewitnesses or victims. If the Saviour had been detained on Friday morning, the trial would have taken place on Friday, and then the entire Sabbath day the court would have had to discuss the fairness of the verdict. Being in a hurry to condemn the Saviour to death, and at the same time officially observing the law of Moses, the Jews committed a vicious and unjust act. Thus, while preserving the letter of the law, the Jewish leaders renounced its spirit of mercy and truth. In order to punish the Saviour with death, the Jews rejected their original accusation for which they had found false witnesses, and condemned Christ for blasphemy. Such a condemnation was based only upon His words to the Sanhedrin (Matt. 26:65). In the language of the law this is defined as self-confession. However, according to law, the punishment cannot be based upon the accused person’s self-confession without being confirmed by the testimony of other witnesses, gathered in the process of the trial, because it was believed that due to extreme psychological tension, a person who stood trial tended to confess to non-existent crimes. In view of the fact that Judea at that time was subordinate to the Roman Empire, in order to execute a death sentence, it had to be confirmed by the Roman procurator. 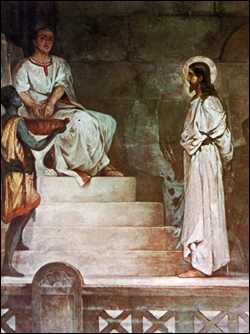 The Saviour was taken to Pontius Pilate, who was the procurator of Judea, i.e. the deputy of Emperor Tiberias, and possessed full administrative, legal, and priestly powers. The place where the procurator stayed was called the praetorium. Since this place contained statues of the Roman gods, the Jews led the Saviour up to the praetorium, but did not enter it, in order not to be defiled before Passover. The Jews stopped at a place called the Pavement, from which the Roman procurator announced his verdicts and decisions. This was a podium about 80 cm. high, encompassing an area of about 180 square meters. The podium was paved with flagstones and covered with an awning. 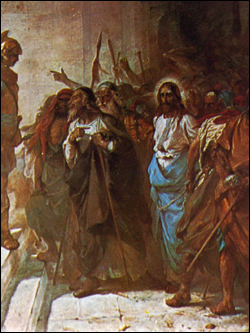 Attracted by the noise of the Jewish crowd, Pilate mounted the judgment seat and asked: “What accusation bring ye against this man?” (John 18:29). The procurator’s words show that he had decided to strictly follow Roman law. According to Roman law, it is impossible to begin a trial without a final accusation. The Jews were not ready to present it. On the one hand, they sought to preserve their relative independence in religious affairs, and on the other hand they feared that their accusation would not stand up in an unbiased and objective court. They therefore replied: “If He were not a malefactor, we would not have delivered Him up unto thee” (John 18:30). 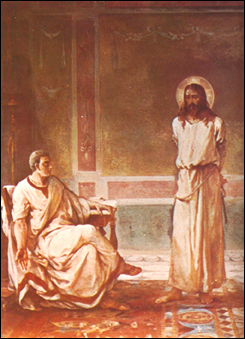 Pilate refused to judge without an accusation: “Take ye Him, and judge Him according to your law” (John 18:31), – he said. Thus the Jews were forced to present an accusation against the Saviour. The holy Evangelists do not describe this accusation, but it is implied in Pilate’s question to Jesus: “Art Thou the King of the Jews?” (John 18:33). The elders’ accusation was ambiguous. The formal truth was reflected in the word “king.” The Sanhedrin condemned Christ because He had declared Himself to be the King of kings, i.e. God, and thus blasphemed. It was not clarified to Pilate precisely what kind of king the Saviour was – earthly or heavenly. The scribes did not dare to accuse Christ of believing Himself to be an earthly king, because many people knew of Christ’s words: “Render therefore unto Caesar the things which are Caesar’s” (Matt. 22:21), while an open assertion that Christ was being punished for blasphemy would not have been accepted by Pilate. Pilate led Jesus into the praetorium for questioning. Here the Lord answered, for the trial was being held in accordance with the law. From His words Pilate understood that Christ’s teaching threatened neither the government, nor civil order. The procurator became convinced of Christ’s innocence also from the fact that the high priests were persecuting Him out of envy, and so he testified: “I find in Him no fault at all” (John 18:38). He therefore made an offer to the Jews, in accordance with existing custom, to let Christ go on account of the feast of Passover. However, spurred on by the high priests and the elders, the people expressed their preference for the brigand Barrabas. At that time Pilate’s wife, too, spoke up in defense of the Saviour, when she told her husband about the terrible prophetic dream she had seen that night. Subsequent. Then the high priests came forth with the following accusation: “He stirreth up the people…beginning from Galilee to this place” (Luke 23:5). Pilate focused on the word “Galilee” and decided to free himself of a difficult affair by passing it on to the ruler of Galilee – King Herod. At that time Herod was in Jerusalem to participate in the celebration of Passover. He had long sought a meeting with the Saviour in the hope that he would witness a miracle. But Christ did not satisfy the ruler’s idle curiosity and did not answer his questions. In resentment Herod gave the Saviour up to humiliation. However, as a sign of His innocence, Herod ordered the accused to be dressed in light garments and returned to Pilate for trial. The ruler of Galilee did not have enough courage to declare Christ’s innocence and free Him. He preferred to return the affair to the Roman procurator. Pilate found himself in a quandary. He gathered the Jews and told them: “Ye have brought this man unto me, as one that perverteth the people; and, behold, I, having examined Him before you, have found no fault in this man touching those things whereof ye accuse Him; no, nor yet Herod, for I sent this man to him, and, lo, nothing worthy of death has been found in Him” (Luke 23:14-15). In order to satisfy the desires of the Jews and at the same time pacify his own conscience at least slightly, the procurator determined the following: “I will therefore chastise Him, and release Him” (Luke 23:16), – and gave the Saviour over to flogging. Pilate declared more than three times that he found no fault in the Saviour. Despite this he gave Him over to flogging. The punishment was severe. Roman whips – made of the sinews of oxen with ribbed tin tips – cut the flesh open, killing a person or leaving him half-dead. The compromise verdict delivered by the procurator was a step towards his final abandonment of truth and legality. Pilate’s faint-heartedness encouraged the Jews, and they increased their pressure. “If thou let this man go, thou art not Caesar’s friend; whosoever maketh himself a King speaketh against Caesar” (John 19:12), – they shouted. These words made Pilate afraid. Several complaints against him had already been sent to the Roman Emperor. Moreover, the accusation of “speaking against Caesar” constituted a betrayal of state and, according to law, was punishable by death. Pilate retreated. He violated the statute proclaimed by Roman law that only a single punishment could be meted out for a single action. Despite the fact that Christ had already undergone an unjust and inhumane punishment – flogging, the procurator approved the death sentence of the Jewish Sanhedrin. “And Pilate gave sentence that it should be as they required. And he released unto them him that for sedition and murder was cast into prison, whom they desired, but he delivered Jesus to their will” (Luke 23:24-25). St. John the Theologian notes: “Then delivered he Him therefore unto them to be crucified. And they took Jesus, and led Him away” (John 19:16). No one raised his voice in defense of the Saviour. The sentence was put into effect. Human injustice appeared to have taken the upper hand, and the forces of evil were victorious. But spiritually and invisibly the supremely victorious God’s love triumphed, and a truly great sacrifice was offered for the redemption of mankind. (Reprinted from “Orthodox Russia,” No. 6, 2000).